Mushroom Medic is a Minigame played in the Extra Room in Mario Party 4. 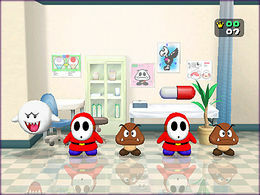 In the mini-game, five characters enter a hospital: Either a Toad, Goomba, Boo, Shy Guy, or Koopa Troopa. Each of them is given a Poison Mushroom, but only one of the patients is infected. It's up to the player to find the critical one. To identify who it is, the player must move the cursor from patient to patient, and see which one's heart beat is different from all the others. This depends on how the controller rumbles. If the rumble is turned off, heartbeat symbols are shown on-screen above each patient instead. If the player gives a pill to the right patient, the player gets another set of them and repeat. For the first set, the player is given twenty seconds and for each new set, the time limit decreases by one second until set sixteen, which gives the player five seconds. If the player does not do it in time, the one who was ill will pass out, while the other ones look at them. If the player gives the pill to the wrong patient, they will have a question mark on their head, instead of glowing, and the critical one passes out. Both ways include the ill one passing out, and the minigame ends with sirens wailing in the distance. "Try to figure out who ate the poison mushroom. The one who ate it will have a different heartbeat." On one of the pictures, the Cheep Cheep's skeleton appears to be a Fish Bone. Also, the Paratroopa's skull uses a design almost identical to the Super Mario World depiction of Dry Bones. If the player gets to 99 patients saved, the sirens will still wail in the distance at the end. Barrel Baron • Beach Volley Folly • Bob-omb X-ing • Bowser Wrestling • Challenge Booksquirm • Doors of Doom • Goomba Stomp • Jigsaw Jitters • Mushroom Medic • Panels of Doom • Panel Panic • The Final Battle! This page was last edited on March 9, 2019, at 16:24.